An example of an LCU Mk. IV of the Indian Navy. Photo c/o Wikimedia Commons. The Indian Navy has commissioned its sixth Mk. IV Landing Craft Utility (LCU) in ceremonies held in Kolkata on 30 March 2019. 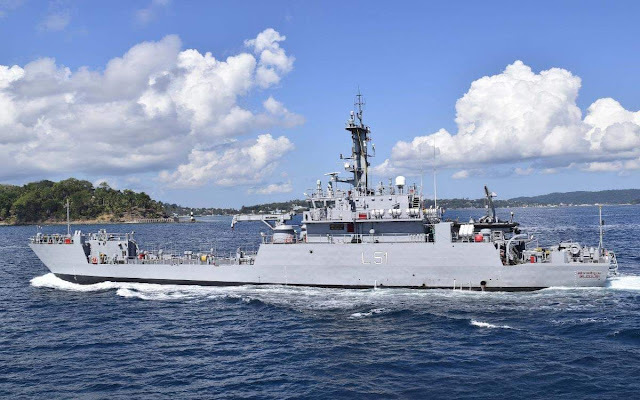 The LCU will hull number L 56 is part of a INR21 billion (US$303 million) contract with Indian shipbuilder Garden Reach Shipbuilders and Engineers (GRSE) to supply and build a fleet of eight (8) new Mk. IV landing crafts for the Indian Navy. The commissioning of L 56 also coincides with GRSE delivering its 100th warship, the first Indian shipbuilder in reaching the milestone. The Mk. IV LCU was designed by GRSE, and has a length of 62.8 meters, a maximum beam of 11 meters, and a draught of 2.2 meters. It displaces at 830 tons, is powered by two MTU 16V 4000M53 diesel engines with 2 fixed pitched propellers and attaining a maximum speed of 15 knots. The ship is armed with two 30mm guns using the CRN 91 Sarath remote controlled weapon station, support by a Bharat Electronics EON-51 EO/IR fire control system. Each LCU can carry up to 160 fully equipped soldiers.